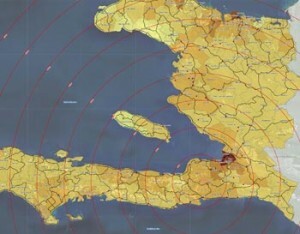 Map of Haiti showing the epicentre of the January 12, 2010 earthquake that demolished Port-au-Prince. Caribbean Community leaders, denied permission to land in Haiti last Thursday to asses the region’s contribution to the post earthquake recovery effort, were meeting Monday in neighbouring Dominican Republic with European Union, US State Department and United Nations officials to discuss a medium and long-term plan for Haiti’s reconstruction. Since Haiti handed over control of its airport and other key services to the US, only military aircraaft are being alowed to land in Port-au-Prince. The Office of Jamaica’s Prime Minister Bruce Golding announced that he along with CARICOM chairman, Prime Minister of Dominica, Roosevelt Skerrit, the secretary general, Edwin Carrington, and Trinidad’s Prime Minister, Patrick Manning, would be attending the meeting at the invitation of Dominican Republic President, Leonel Fernandez, The meeting is being convened by the King of Spain, in his capacity as chairman of the EU. In discussions with Golding on Saturday, during a brief stopover in Jamaica from Haiti, US Secretary of State, Hillary Clinton, noted that CARICOM would have to play a critical role in Haiti’s post-earthquake recovery. She said that Jamaica, being the hub of CARICOM’s Haiti earthquake relief and recovery efforts, would be central to its success. Golding is expected back in Jamaica Monday evening. Meanwhile , Jamaica’s programme of assistance to Haiti has been stepped up with the scheduled departure Monday of a Canadian military aircraft transporting equipment needed by telecommunications firm Digicel to get its network back up in Port-au-Prince where lack of service is one of the major problems facing the Haitian government, in coordinating its relief efforts. Other relief assistance being offered by Jamaica includes airlift services for Jamaicans out of Haiti; use of the airports to help relieve the congestion that is being experienced at the Port-au-Prince airport; waiving navigation and landing fees to all humanitarian aid to allow them to stay here; provision of re-fuelling facilities; use of the Reynolds Pier in Ocho Rios, on Jamaica’s north coast, for vessels to re-stock with water and the establishment of a base camp in Haiti from which all CARICOM donations and aid staff are being dispatched. I pray for those people who have been injured in Haiti. the earthquake in Haiti is one of the worst disasters this year. I just hope that they would be able to recover soon.